3rd Person View "All Sports Pro"
The 3rdPersonView ALL SPORTS PRO is a NEW, more stable, version of the 3rdPersonView mount. 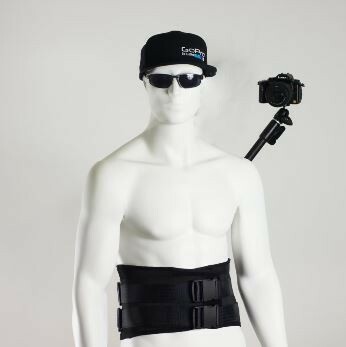 We developed the PRO version due to the demand from the professional film industry for a solution that could support heavier camera's and have even less movement of the camera pole. To realise this we modified the backplate so that is now has 2 non flexible belts (that go over the elastic velcro belt). 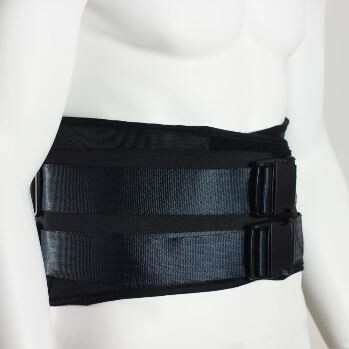 This ensures that the belt and back plate have even less movement around the body. To enhance the stability of the camera pole (and let it support heavier camera's) we designed a set of stabiliser straps. ; these work like the stays on a sailboat. 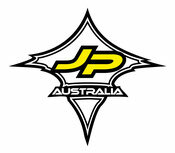 On the straight pole there is a clamp that can be adjusted in height and that has 2 straps with quick releases. 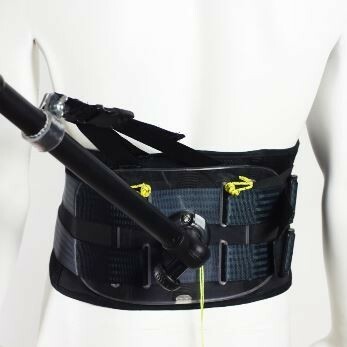 These quick releases are connected to straps that are fixed to the backplate. Once the camera pole is in the right position you connect the quick releases and tighten the straps to the max. This setup allows you to set the pole at any angle and still tighten the straps for max stability (and quickly remove the pole if needed). 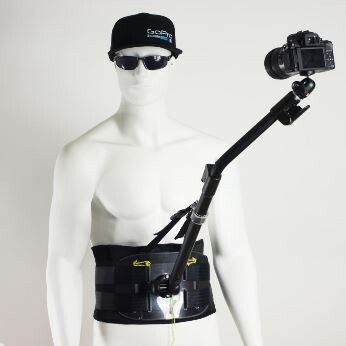 The possibility to reverse the belt (with the pole in front) makes this an ideal lightweight 'Snorricam' so that you can film yourself from the front without the use of a cameraman. The belt has been designed to fit (almost) everyone that has a jeans size between 28 and 35 and can even be used with ski or motor jackets. 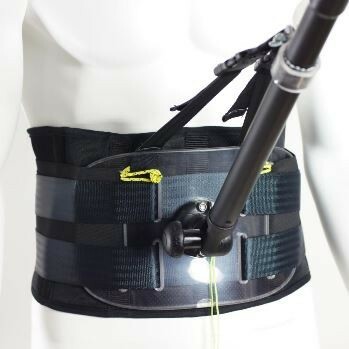 • The backplate that is made of clear technical polyester sheet that is extremely durable and that is worn with a waterproof adjustable sports belt, and an two additional (non flexible) belts for extra stability. 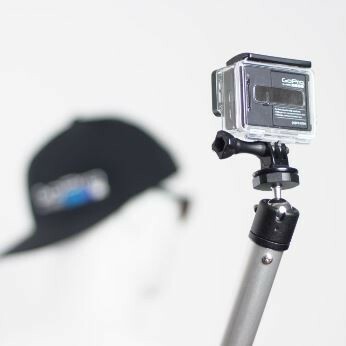 • Fully adjustable light weight aluminium camera pole with a BLACK anodised finish. • A set of 'Stabiliser Straps' for extra support and stability. *The 1st straight part that connects to the baseplate with the unique locking/release mechanism. 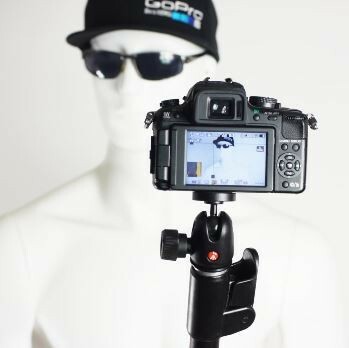 This mechanism lets you place the pole in any angle or rotation, to give the most options in placing your camera. 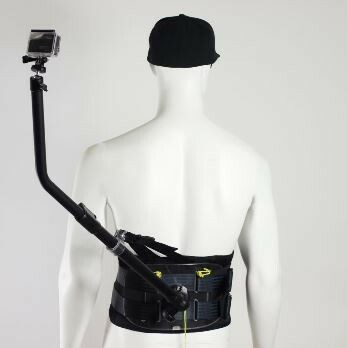 *The 2nd part that has a 40 degree angle (so the camera will not just be filming the pole, but you) and help you set up many different angles. The mini ball head allows you to mount any (small) camera with a standard 1/4 inch camera screw connection. You will have complete control in setting the camera angle to get the shot you want. The mini ball head is screwed to the camera pole for maximum stability (the pole is pre-drilled at both ends. 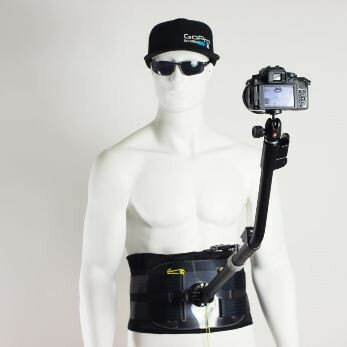 You need this mini ball mount for the 3rd Person view Mount if you dont have one!